Did Waterhouse make a profit? 1916. THE PIECE OF LAND AT THE CORNER OF FORT AND HOTEL STREETS SOLD FOR $80,000. That section of land at the corner of Fort [Papu] and Hotel [Hokele] Streets, on the Ewa side of Fort and makai of Hotel, 57 feet on Fort Street and 37 feet on Hotel Street, was purchased by the Waterhouse Company from Mrs. Mary H. Damon for $80,000. This is the area proposed by the Board of Supervisors [Papa Lunakiai] for road widening some time ago, and it seems that this place will be taken by eminent domain [hoopii hoohewahewa] so that the county can widen this area of the street. This area of Hotel Street is narrow indeed, and if it is widened, the width will be good, where we will be able to say the street is uniformly wide, and not narrow like it is now. If the electric car on Hotel Street continues on here, other cars would not be able to come or go because of how truly narrow it is; but if it is widened, other cars can travel without any confusion, for the street will be wide enough. Ke Aloha Aina, Buke XXI, Helu 22, Aoao 1. Maraki 4, 1916. 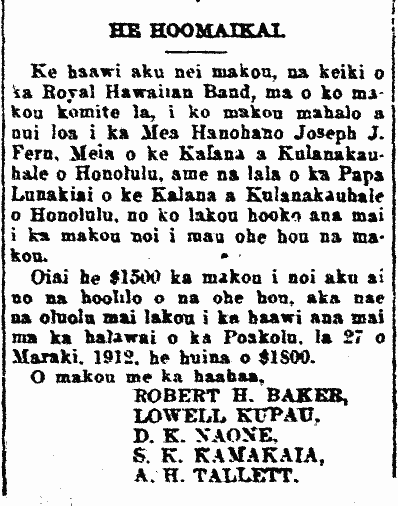 Royal Hawaiian Band gets new instruments, 1912. We, the boys of the Royal Hawaiian Band, by means of our committee, give our great appreciation to the Honorable, Joseph J. Fern, Mayor of the City and County of Honolulu, and the Board of Supervisors of the City and County of Honolulu, for their approving our request for new wind instruments. Although we requested $1500 for the costs of the new instruments, they kindly granted us at the meeting of Wednesday, the 27th of March, 1912, the sum of $1800. Ka Nupepa Kuokoa, Buke XLVIII, Helu 14, Aoao 6. Aperila 5, 1912. Keeping the streets of Honolulu clean? 1912. TO PRESERVE THE CLEANLINESS OF THE STREETS OF HONOLULU. Honolulu will become one of the most cleanest cities in the world should the law that the Board of Supervisors [Papa Lunakiai] passed for the second reading on the night of this Wednesday, progress and go through in the future. This is the law that will outlaw the discarding of cigarette and cigar butts on the street which was put to consideration before the board last week. In the new law, throwing and littering of all kinds of rubbish on streets and lanes is strictly prohibited, and all persons seen doing this: throwing a bottle or empty can, fruit peel, pieces of paper and other things that will alter the beauty of the streets and lanes into rubbish piles, he or they will be brought up on charges, and if found guilty, a heavy punishment will be doled out upon him or them. It is not only prohibited on streets, but also on beaches, because rubbish and other trash is seen being just thrown on the sand. There is a law pertaining to the sidewalks as well before the board. This law will go into effect after fifteen days from its passing, and within the area specified, sidewalks will be made by the owner or owners who the sidewalks belong to, and if he or they do not make them, the government will do so and charge the expenses to the owner to whom belongs the sidewalk that was made. The area covered in this new law is from the pier until Beritania Street and between Nuuanu River and South Street; and within this area, owners will be required to build sidwalks. Ka Nupepa Kuokoa, Buke XLVIII, Helu 13, Aoao 8. Maraki 29, 1912. Early Consolidated Amusement and movies on Sundays, 1915. ASKED FOR APPROVAL TO SHOW MOVIES. Being that a law was passed in this past legislative session giving the responsibility to the board of supervisors of each county to make laws to approve showing movies on the Sabbath; the Consolidated Amusement Company put a request before the board of supervisors of the City and County of Honolulu at the meeting of that board on this past Tuesday night, to ask for approval to show movies on Sundays. But the request by that company was placed in the hands of a committee to consider, and to give its findings at the next meeting of the board; however Supervisor Arnold made his opinion clear that the only means by which those sorts of requests will be approved is by making an announcement of the law for which the board will spend much time holding meetings, before it is clear whether or not a law of that kind will pass or not. From what is understood, Mayor Lane opposes the approval of movies being shown on Sunday, but some of the board members do not disapprove, but they believe that it is more important to give to the public all things that will make them happy on Sundays. Ka Nupepa Kuokoa, Buke LIII, Helu 20, Aoao 5. Mei 14, 1915.